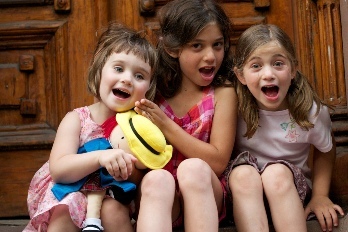 Grandchildren - Trixie, Eva and Rose, from left to right, in June, 2011. This is a website for parents of children between the ages of 3 and 8 who want to help them to understand arithmetic. It is based on my experiences teaching my own children and now my grandchildren, and on more than 10 years of teaching arithmetic in an elementary school in New York City. I know from these experiences that young children can learn arithmetic – that is, they can learn to reason confidently and correctly about problem situations involving numbers. I also know that parents can help - all they need to do is to provide the kind of brief, informal "lessons" shown here. click here to see me helping Eva (at 7 years, 8 months). An important thing to notice about these lessons is how short and informal they are. They are perfectly typical of all that it takes. For my thoughts about teaching addition, subtraction, multiplication and division (with video examples) click on the corresponding tabs above. But a good place to start would be on the Goals tab and then on to the Methods tab. For a more informal start you might instead want to just browse the videos by going to the Video Index tab. If you are interested in the details of my qualifications, click on the Resumé tab. P.S. All of the videos in this website are of my grandchildren, Eva, Rose, and Trixie. This is only because they are the only children that I have regular access to. Not for one second do I believe that any mathematical abilities they may have are inherited. Based on my years of teaching I believe that almost all children can learn to do mathematics. P.P.S. This website is optimized for viewing in Google Chrome.